Successful brand names can help create an allure and the idea of high quality. A woman may choose to pay more for a leather handbag because it carries the name “Louis Vuitton” or she may choose to purchase a specific line of hair care products because she’s “worth it”. Branding can help to distinguish products from their competitors while also creating the idea of consumer confidence. This is also a good way to increase profits as often times consumers are often willing to pay more for a name they know, recognize, and equate with high value or status. Diamonds are no different. Is a “Leo” diamond better than a “Hearts on Fire”? And is either better than a GIA graded diamond with an Excellent cut, but no brand name? The idea of marketing a “brand-name” diamond is not a new concept, and is centered on simply a specific combination of proportions that were used to cut the diamond. When light interacts with a diamond, every angle, proportion and facet affects what is returned to the viewer’s eye – this is what gives a diamond a face-up appearance. As shown above, these basic parts all have a relationship with each other, and their basic proportions in combination to the precision of the diamond’s facets are contributing to the interaction between the diamond and light. The bottom line is this, that every facet, every angle and their relationship to each other affect amount of light returned or lost in a diamond. The majority of diamond brands focus on and promote the idea of an “ideal” cut diamond. The claim is that their specific proportions create the maximum amount of fire (flashes of color seen within a diamond) and brilliance (reflections of white light). For example, the “Leo” diamond is one that has 66 facets rather than the standard 57-58 of a Round Brilliant, while the “Hearts on Fire” diamond has “hearts and arrows” that can be seen in the table down position. Do the extra facets create a more brilliant diamond? What is more likely to create the most brilliance is a diamond with proportions that fall within certain limits, and all well cut diamonds will display “hearts and arrows,” not just the ones that are branded as such. 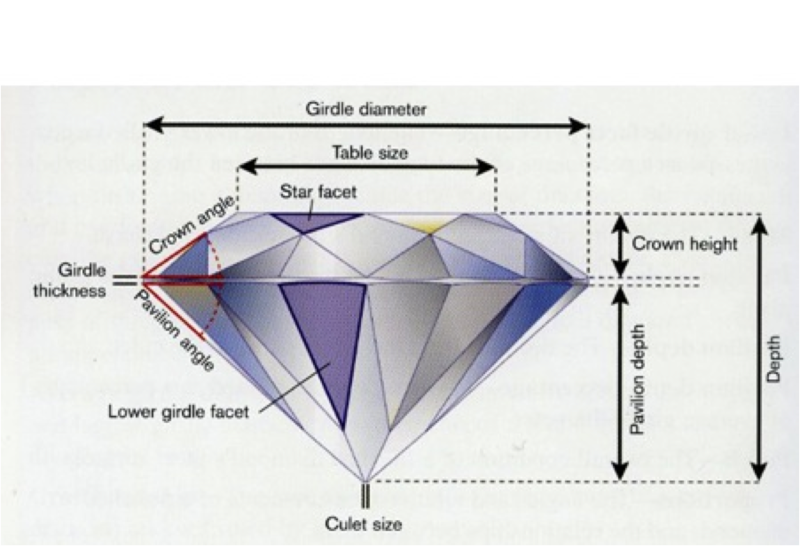 Modern diamond cutters have made an attempt to derive the “best” table size, pavilion angle, and crown angle for a Round Brilliant. They argue that the values of these three proportions will produce the most fire and brilliance in a diamond. While there are agreed upon standards for a well cut diamond, there is no positive proof that any one set of proportions will produce an “ideal” cut stone. GIA (the Gemological Institute of America) does not recognize an “ideal” cut, but rather has created a standard cut grading system. This system assigns a cut grade as determined by that specific diamond’s proportions and the amount of fire, brilliance and scintillation or pattern the diamond displays: Excellent (Ex), Very Good (VG), Good (G), Fair (F), and Poor (P). In addition to a cut grade, GIA also assigns a grade to the diamond’s overall finish. That grade describes its polish and symmetry as a reflection of the craftsmanship that went into the stone. Using the same scale from Excellent to Poor. These two grades combined reflect how much fire and brilliance a diamond displays. Keep in mind that like the rest of the retail market, a brand name diamond may be more expensive even thought is the same grade as all the others on the shelf. What is important to understand is that not all diamonds are created equal and how well a diamond is cut has a large impact on its beauty. Remember, a diamond that is GIA certified as having an Excellent cut will shine, fire, and sparkle just as much as one that carries a brand name. Every diamond is cut with extreme care and craftsmanship. Every facet in a well-cut diamond acts as a tiny mirror that interacts with the light to help create the stone’s face-up appearance. Two 1.00 carat diamonds with equal clarity and color characteristics set side by side both with Excellent cut grades will both display equal amounts of light. The only difference may be that one may have a brand name, and carry a higher price tag. If you are selling a loose or mounted diamond get in touch with us and take advantage of our free consulting. “About the 4Cs.” About the 4Cs. Gemological Institute of America, 2012. Web. 02 Aug. 2012. <http://www.gia.edu/lab-reports-services/about-the-4cs/index.html>. “Features.” Unsurpassed Diamond Brilliance. Leo Schachter Diamonds, LLC, 2012. Web. 02 Aug. 2012. <http://www.theleodiamond.com/theleodiamond/unsurpassedbrilliance.aspx>. “The Cut Of Our Diamonds.” Diamond Story. N.p., 2012. Web. 02 Aug. 2012. <http://www.heartsonfire.com/learn-about-our-diamonds/the-story/the-cut.aspx>.